From the day that I picked up my new generation Apple TV I have been looking forward to Real Racing 3 being ported to it. Despite my issues with the free-to-play business model built around it, Real Racing 3 really is a very, very good quality racing game, and has, over the years since its release, built out to offer an obscene amount of content. 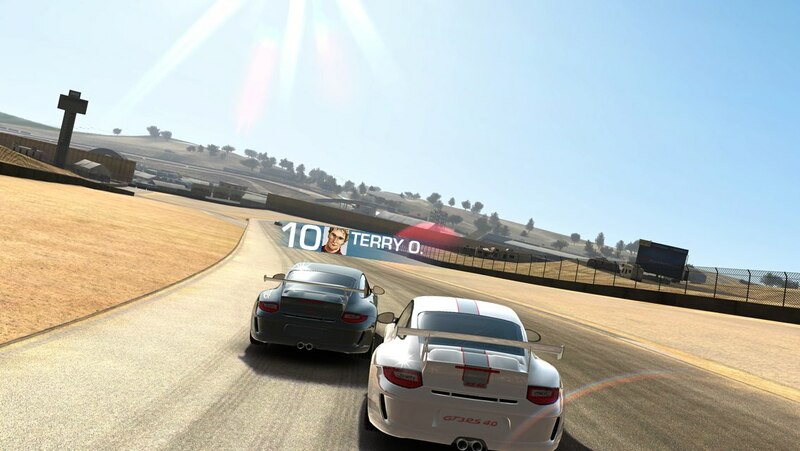 Related reading: Matt's original review of Real Racing 3, from back in 2013. And it’s a good looking little racer to boot. I’ve actually wanted for EA to give Firemonkeys the opportunity to break out from mobile development and build a premium version for consoles, because I have felt that there’s enough depth in it to support long sessions of sitting down with a controller in hand. While Real Racing 3 on the Apple TV hasn’t done away with the free-to-play business model, I guess this is still an ideal way of doing a “console” version of the game. I'm playing the game on my TV at home, in other words, and I couldn't be happier. Modelled more closely to the likes of Gran Turismo than purely arcade racers like Need for Speed, Real Racing 3 tasks players with collecting a wide variety (over 100) of real cars, and then taking them on a wide range of different racing challenges across a number of real world tracks. 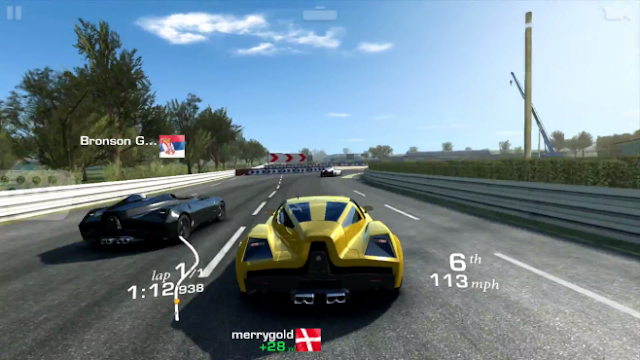 From the standard race, to head-to-head, elimination (where the last-placed racer is knocked out every 20 seconds) and pursuit modes, each challenge rewards players with trophies that unlock additional challenges (assuming you come inside the top three), as well as cash to buy more cars. You’ll need to keep buying more cars, because each challenge is locked to either one car, or a small collection of cars that share similar stats. This means you won’t be able to rely on a single super-fast car to get through all the challenges. Each car can be upgraded a number of times, and each upgrade costs in-game cash, and the main way that Real Racing 3 monetises itself is by setting the challenges at such a point that to win, you really do need a fully-upgraded car, which takes a whole lot of patience to earn if you’re looking at doing it through cash earned through races. But you can get through Real Racing 3 without spending money. I’m much more comfortable with the monetisation model now than I was back when I first played it on iPad, but then the fact I’m still playing the game also means that the game has validated itself to me. I don’t think I’ve played any racing game more than this one, in fact, so I don’t begrudge EA and Firemonkeys for occasionally eliciting a few dollars out of me to speed the upgrade curve up somewhat. Overall I’ve still paid far less into this game than I would have to buy a full-priced premium game, so value for money is definitely there. One of the features I’ve really enjoyed with Real Racing 3 over the years is the way it handles asynchronous multiplayer. On iPhone/ iPad, where Internet connectivity over 4G wasn’t a guarantee of stability and speed, Firemonkeys’ solution was to have each race “import” the name and Game Center profiles of people from around the world - including any friends you have on your friends list. At that time the engine would also import some basic behaviour patterns, speed, and driving ability of the racer. So in other words, the poor players on my friends list had to contend with a hoon quite comfortable with ramming everyone else off the road on their way to first place when the system unluckily drew them against me. On the Apple TV, the connectivity issues is not a problem, so the asynchronous multiplayer is a clever solution to something that doesn’t need solving, but it is still a nice touch in keeping races feeling varied and giving the AI of cars some variety beyond sticking to perfect racing lines at a steady speed. 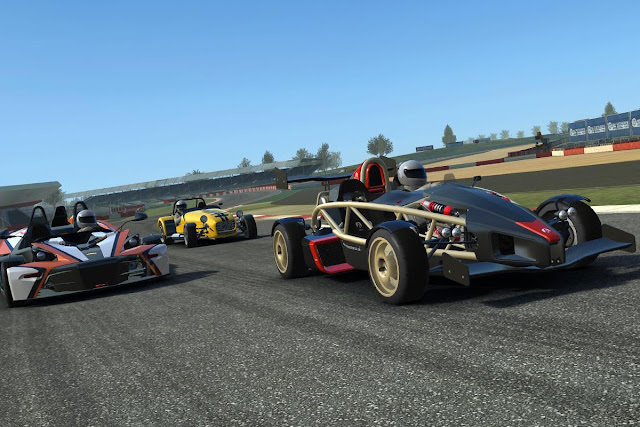 Related reading: An interview with the project lead on Real Racing 3, from 2013. 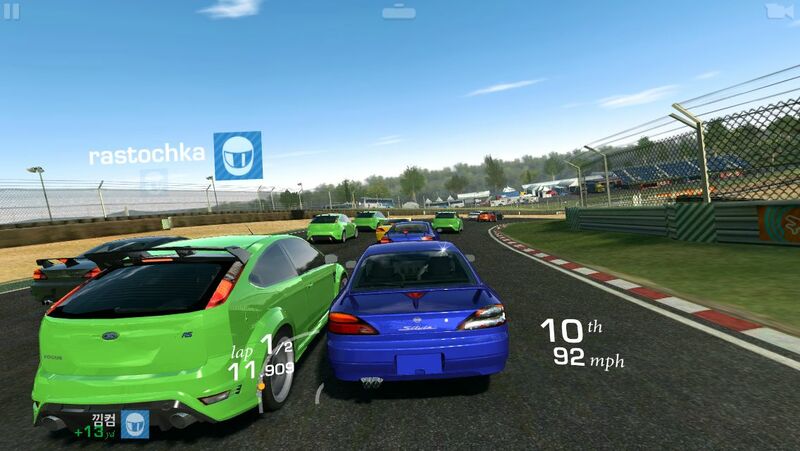 In the time since the original release, Firemonkeys has also implemented online racing, including the chance to join “crews” and other such social features. None of this does anything for me. On my stable Internet connection I still see a lot of stuttering of cars in multiplayer matches, and there’s no real value in joining crews, other than for people that do feel social. There is a local multiplayer mode thrown in, however, and that’s ace fun. While Real Racing 3 is based on the Gran Turismo approach to racing, the default settings wrest far too much control away from players. Originally designed for touch screens as it was, the game handles acceleration automatically, and features extremely generous brake and steering assist, so that people that struggle with touch screen controls can still enjoy themselves without feeling overwhelmed. Playing the game on the Apple TV remote, and I found these assists quite valuable, because the Apple TV remote is not a particularly good controller for something that requires the precision of a “serious” racing game. Throw a controller into the mix and it’s all far, far too easy going on those settings. Thankfully, it’s possibly to switch all assists off, and Real Racing 3 has no problem punishing people who over accelerate into corners. The feel of the cars with the controller is good. Steering’s a little soft, perhaps, but there’s a lovely gracefulness to nailing a complicated sequence of turns. The fast cars really do feel fast, too. It’s a long grind to get up to the advanced challenges that will let you play in those beasts, but it’s certainly a reward into itself getting up to them. And because Firemonkeys continues to update the game with new challenges and cars, this is a game that has real longevity - in fact one of the reasons I do continue to play is because the game that Real Racing 3 is today is so much more than what it was a couple of years ago at launch, and one of the benefits of the free-to-play model is that these “DLC” updates don’t cost at thing. I certainly prefer playing Real Racing 3 on my Apple TV now, and will do so going forward. The move from mobile platforms to the big screen TV has been a natural one for the game’s base engine, and the content releases remain strong enough that I suspect I’ll be playing this for some time into the future too.